Front Porch Realty - Our Schools Need Us! 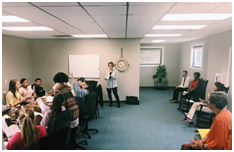 I was recently asked to speak to a group of local Fuquay-Varina Middle and High School students as a business owner in the community. I wanted to share my experiences, in hopes that more business members in our community would be inspired to volunteer. Each activity took me less than an hour. I know that hour could lead to a big impact on these young adults as they begin to think about their future. As always, I know I got more out of it than they did! My friend, colleague, and educator, Mr. Rodney Jenkins, is the Career and Technical Education Coordinator for Fuquay-Varina Middle School. He recently approached me and asked if I would speak to his entrepreneurial class. My topics included: why I started my own business, what’s involved with owning my own business, the hardest part, the easiest part and more. I brought along my company’s advertising goodies like stadium cups and pens, and tossed some candy to the students that participated. The students had awesome questions and provoked my own thoughts on why I do this. I was overjoyed to hear the students decided they are going to arrange a “field trip” to visit our office sometime soon. I can’t wait to see them again! There are so many opportunities to get involved with students in Fuquay-Varina. I was also asked to address the first Fuquay-Varina Youth Leadership Group conference. This initiative is the first of its kind for Fuquay-Varina and the students selected to participate. I was asked to speak about Front Porch Realty’s application process and how I determine good candidates for our firm. Laura Moody recently addressing both students and staff. These bright, energetic high-schoolers had so many great questions for me! They are eager to learn how to make a difference in our town and they are striving for greatness. I commend the staff of Fuquay-Varina High school for working so diligently to start this leadership program and make a difference in these student’s lives. Imagine all the lucky businesses that get to hire these young folks someday! If you are interested in helping any of our community schools in ANY way please contact our office or join the FV Business Alliance. Our next meeting is coming up soon!